The Spaniards took the tomato, native to the tropical Americas, to Western Europe by 1550. The tomato reached India much later, through England, around the late eighteenth century. Did you know that? And all this while, I thought India had the patent on the tomato! And where do you find information like this? In Ammini's Grains, Greens and Grated Coconuts, of course! There is so much every day stuff that we take for granted. The chillies and most of the spices we take pride in, really came from other lands. That I knew. But that the tomato was not native to India came as a big surprise. I can't imagine a day when I do not have some form of tomato easily available in my home. If I don't have fresh tomatoes, I have cans of diced tomatoes as well as cans of tomato paste. I've found that most people I know put their tomatoes away in the refrigerator with the other veggies they bring home. But fresh tomatoes should not be stored in the refrigerator unless they are already very ripe and you know you won't be able to use them within the next couple of days. Temperatures cooler than 50F-55F change the flavor of tomatoes and also stop the ripening process. 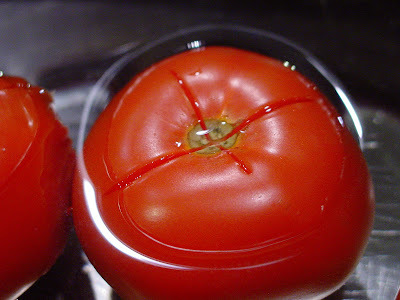 Once cut or sliced, use the tomato quickly as it deteriorates quickly and refrigerate it, if necessary. Don't stack tomatoes one on top of another. The tomatoes at the bottom will get bruised. And if you have to refrigerate them, bring them to room temperature to bring back some of the lost flavor. Tomatoes are rich in beta-carotene and cooked tomatoes are considered even healthier due to the benefits of lycopene. 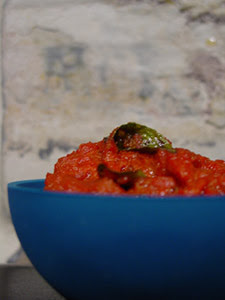 That's what I like about Ammini's Thakkali (Tomato) Chutney. All that lycopene! Plus I get the benefit of much more - a spicy tangy flavor - as soon as I put it in my mouth! Ammini's Thakkali Chutney was on the menu for our cook together but we had a shortage of burners and we had several of my homemade pickles that everyone was very keen on tasting. So we dropped it from the menu. To my friends who were there at the cook together: I am really really sorry! This fresh tomato chutney makes you long for it when you see it, makes your mouth water when you smell it and is sheer bliss when you finally get to eat it. I will make it up to you, I promise! 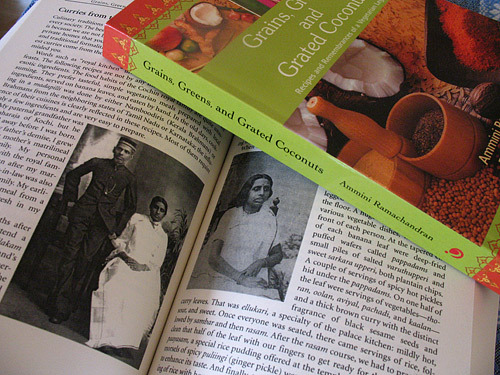 From Ammini Ramachandran's Grains, Greens and Grated Coconuts. Boil water in a large pan. Score an X at the stem end of each tomato. When the water boils, drop the tomatoes into boiling water for about 30 seconds only. Take them out promptly and drop them into cool water. This process makes it easy to peel the tomatoes. Once they are cool enough to handle, peel off the skin. 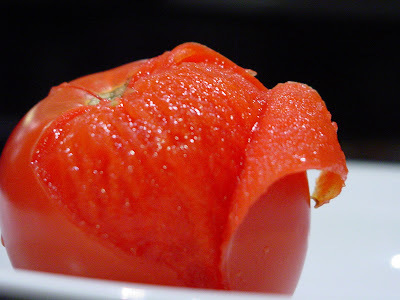 Cut the peeled tomatoes in half, discard the seeds, and thinly slice the tomatoes. Cook the tomatoes with two tablespoons of water, turmeric powder and salt. Once cooked, remove the pan from the stove and mash well with a fork till you have a thick purée. Heat the vegetable oil in a small skillet and add the mustard seeds. When they pop, add the cumin powder, powdered fenugreek, chilli powder, asafetida, and curry leaves. Do not leave this on the stove for longer than a minute as the fenugreek powder will burn and taste bitter. As will the chilli powder. 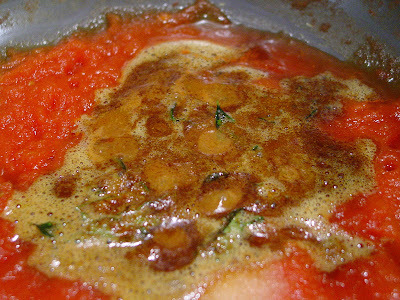 Combine the cooked tomatoes with the spices in the oil, and mix well. You can have this immediately or chill it in the refrigerator and serve it with idlis or dosas. I have had it on toast and bagels, too! I served it with my dear friend Anita's rava idlis. This was a meal par excellence - two recipes that complemented each other perfectly, from two brilliant women that I have had the good fortune to come to know. The first time I made this I was hesitant to add more than 1 tsp of red chilli powder. The color of the chutney was rather lacklustre so I added a tablespoon of tomato paste. This was a hit with Medha. The next time I made it, I added two teaspoons of red chilli powder and 2 teaspoons of Spanish Red Paprika. This was just the right amount of heat for us and the paprika gave it that wonderful color. Medha was not happy! Make fenugreek powder at home in your coffee grinder by grinding 3 tsp of fenugreek seeds. Ammini says that this chutney will keep well in the refrigerator for two weeks. She also makes this chutney with canned tomatoes. Bottled or canned Italian San Marzano tomatoes have the right degree of acidity and blend very well with the spice mixture. In the absence of Italian tomatoes, substitute any readily available canned tomatoes. If you use canned tomatoes, mix it with about a half-cup of water, salt, and turmeric powder, and cook until the mixture has thickened. Then follow the recipe as above. This recipe yields between 1.5 to 2 cups, depending on the size of your tomatoes. I am going to send this to my friend RP, also from Kerala, who is hosting Jihva for Tomatoes in April. More about Sue Darlow: Sue Darlow is a freelance photographer whose work has appeared in numerous publications, including New Internationalist, The Times Literary Supplement, The Economist, The Times Educational Supplement, The Guardian, The Independent on Sunday, Our Baby, Reader's Digest, The Vegetarian, Country Life, Sainsbury's magazine, Food Illustrated, New Cyclist, Bike Culture, and Encycleopedia, as well as various books and peripheral publications. She has also held shows in England and Taiwan. Sue also spends a considerable amount of her energy documenting the life and customs of the Parsis in India. Update: Sue Darlow passed away in April 2011. Manisha, love the color and texture on this...beautiful, never thought thakkali chutney could look so pretty. I am just going to gracefully accept the compliment. Thank you. My name does mean 'grace', really. And I will definitely be making this chutney; you have suggested a fine pairing! May I also add, that I am planning a chutney entry for JFI myself? I swear, it is not because I'm feeling competitive or anything. Truce! That bright red is so beautiful. When worried about your innards, do the same (mixing red chilli powder and Paprika) to make the Kashmiri dishes you want to try - you'll get the colour with the desired heat. You admit colour is important! I love that photo of the skin peeling back from the mater! And I love love love love love tomatoes. I'm allergic, but it doesn't stop me. Oh, yeah, forgot to add - those pics are great - such a saturated red! Not natural light though? You do great with 'indoor night time'. Everything starts to have that yellow glaze in mine. I really struggled with the pictures for this thakkali chutney. If paal paayasam was difficult to photograph, this was even more difficult. Daylight did not help. The warm glow of the lights above my stove did not help. I couldn't get my clunky tripod into place and shoot macro shots. I was getting so frustrated that my usually steady hand became shaky. I was afraid I would only have unappetizing pictures of a red lump of something! So Sig, thank you! It means a lot! Anita, what? it's the truth! You have no choice! BTW, your rava idlis were simply super. We loved them. I had several by themselves before I had them with thakkali chutney. The red is definitely from the paprika and yes, that is very close to the red of the chutney. My red chilli powder, while potent, and despite being Kashmiri, has no color. I must have been cheated, I tell you! I discovered very recently - after owning this camera for what will be 5 years this Mother's Day - that it has a setting for white balance. It always used to be on Auto. The other settings are Indoor, Outdoor and One Push Set. The Auto and the Indoor always give me a reddish-yellow hue after dark and with the lights on. It's very unnatural. I get natural colors when I use the One Push Set which meters the white light and gives me as close to the natural colors as is possible. Look for a similar setting on your camera. If my 5 yr old 4.1 megapixel camera has this, yours must, too! Pel, there are two things wrong with that picture - it's way too close and my hand shook. Both have added to a slight blur. 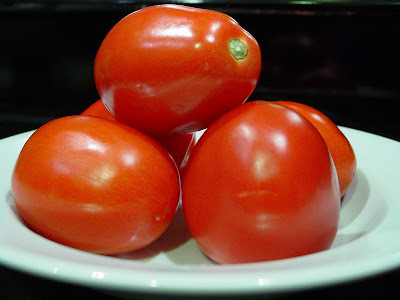 Do you know what it is about tomatoes that you are allergic to? I have a friend who is allergic to uncooked vegetables. Cook them and give them to her and she's fine. This thakkali chutney will come alive with really good tomatoes. Tomatoes in winter are very insipid. I tried the beefsteak tomatoes - they were awful. The vine-ripened had no flavor. The only other ones were plum and they were the best tasting, non-floury tomatoes I could lay my hands on, so I used them. I can't wait till summer when tomatoes are in season! Mmmm! I am sure this will be super with your canned tomatoes! Will report back after I try this and with the same combination as such by you ! Great recipe Manisha.Love the step by step photos. Most spices were brought into India by Spaniards! I never considered tomato to be Indian. Maybe because I never saw it being grown in Kerala. The chutney looks fiery. I once made a chutney with almost all the same ingredients, and didn't like it much. It was almost a burning sensation on the tongue with no real flavor. I will try this out because I trust you and Ammini after that 'strange sounding' okra kichadi. I found out about white balance an d macro setting last year when I was reading the camera manual. What a difference it was after that. Nope, no WB setting on my (obsolete) Kodak EasyShare 3.1 meagapixel :-( I just take a lot of pictures and hope for the best! I see a setting for night time though which I should probably give a try. But soon...if we still have anything in the kitty after the office is done! Fat chance, that. and I should get my hands on that book - everyone's raving about it! btw, camera trick or not, the red hues are stunning! I did not know that you spend so much time taking pics with all those minute details, wow one learns everyday! I want to make this one, a quick Q.
I've the store bought methi pwd, will that change the taste in anyway? I don't want to take any shortcuts for traditional dishes, I use the pwd in my dal everyday and it still does have the potency. Nandita, my dear! I am just sharing Ammini's recipes that I used in a cook together I hosted in December. With her permission, of course. I like taking pictures. I usually find it as relaxing as the process of cooking. I don't do any food styling, preferring to present the food as it looks. Indian food is very unphotogenic. Look at all our dals - yellow. What do you do with them?! So it's a little bit of a challenge, too. Do try thakkali chutney with this combination. @ noted that her (his? don't want to make any assumptions here!) mother uses the same proportions. Is it tomato season in Bombay? Asha, thanks! Did you perhaps mean the Portuguese? Some spices were brought to India by the Portuguese and the Dutch. And then the Chinese and the Arabs also contributed by bringing in more spices and vegetables. There is a whole section in Ammini's book about Spice Trade, central to Kerala, of course. You could also read Along the Pepper Trail and From Silphium to Asafetida: A tale of two ancient spices for some historical information on spices. And then there is Spice Trade for more reference. Gini, 2tsp red chilli powder + 2 paprika was ideal for us. Also, the quality of tomatoes makes a huge difference to this chutney. So bite into one of the tomatoes to make sure it is delicious before proceeding with this recipe. @, no camera tricks. I promise. Check out the link for white balance in my previous comment as it explains how digital cameras are not quite as smart as our eyes. The chutney is a vibrant red because of Tone's Spanish Paprika. Thanks for confirming that Ammini's recipes are indeed authentic. I know I like the tastes and the ease of cooking. Richa, I have an interest in photography but I am not that good. I am always looking and learning from experienced folks who are better than me. Flickr is a great place to do that. If you have store bought methi powder and it is fragrant, you could use it. I would assume that it is the same with methi as it is with other spices, once you grind/powder it, the oils are released and the deterioration begins. What is asafetida? Is it the same as asafoetida? this would be great on pasta. That might be interesting to try. Although I am not sure I want a methi-flavored tomato 'sauce' on my pasta. See what conditioning does to our palates?! Yeah i meant 'our favourite' lady's tomato chutney....now does that narrow the choices LOL! I don't know if it is tomato season, but I see mountains of them in the parle east market, at around 12 rupees a kilo! Also planning to make a bunch of sundried tomatoes from Anjali's directions. Anjali's sun-dried tomatoes have been bookmarked for summer! As has Ammini's adamanga pickle. Yeah, why didn't I think of that! Of course,a camera is an office expense! Those idlies are really good and really instant. One time I deviated from the quick 'mix and pour' since many other recipes on other blogs recommended some soaking time half hour to 4 hrs. Bad idea, at least for me. I've never had flatter and mushier idlies! 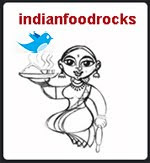 I am going to make your rava idlis very frequently. I didn't add any green chillies because I had a whole red chilli in there already. Now that I know how many Medha eats, I will add green chillies to the rest of the batter. I ended up with 25 idlis. So we got a meal and a snack out of them! Instant gratification and more!! Manisha again the flickr had got me guessing though I knew this was for JFI was wondering what would be the entry. The blanched tomato looks awesome. 2 teaspoons of tikhat is too much for me but I'll taste and adjust. This would taste amazing with lacy appams too. You presenting a Keralite dish to a Keralite :). I'm here, I'm here. I bought some dill and diakon radish among other vegetables this week from the farmer's market.Yup, I've made my pick. Cooking will begin on Sunday! I don't have to go on an hike to find a flower for O. I found a nice one right outside my doorstep! Manisha, about thakkali chutney - Will it make a big difference to the dish if I don't peel the tomatoes? @ noted that her (his? don't want to make any assumptions here!) LOL! 'her' is the right word! thanks for the White balance info - I have to see if my camera has a setting. Finally rava idlis, i making some tonight again :). kuchh idlis bachi hain kya? Anjali, leave me a note on Flickr and I will add you to my contact list. I made this thakkali chutney twice in the past month and the pictures of the tomatoes and the chutney being cooked are from the first time while the pictures of the finished chutney are from the second. I used 1tsp red chilli powder the first time with some tomato paste for color. The second time, paprika gave it the brilliant red color. Ah! She's back! Found 'O' on your doorstep, Shilpa? Wow! If only I were so lucky. I have 3 inches of snow. Yup. And you have a Farmers Market already in progress. I can't remember where I read it - on a blog or on some forums - this person did not peel their tomatoes. Her recipe was slightly different but she blanched the tomatoes before she proceeded. I think the idea is to have as homogenous a chutney as possible. With peels that would not be possible. If I find the link, I will post it here. Looking forward to hearing which mujj chatin you made and how you liked it, or if you made both, which you preferred. Are you making Anita's carrots & potatoes with dill? Or something else? @, :-D yeah that white balance makes all the difference. Musical, no idlis left over! But I am going to make more soon! Medha said they tasted like upma in the shape of an idli. She's an upma and idli fan. I think anything with rava or sooji, she likes. She used to hate the shira/halwa that is served as prasad after pujas but on Gudi Padva, she ate her own and mine. The farmer’s market here is open throughout the year and it has all the Indian vegetables. tindora, padwal, gogura, dosakai, karela, arbi, you name it and the farmer’s market has it. I love it and go there even when it is slightly out of the way. I actually drool just looking at the veggis. I am going to try the carrot, potatoes, peas and dill and the spicy version of muji chatin. I make the Maharastrian version all the time, so this is something I’m really looking forward to. I’ll make the original version of the tomato chutney sometime soon and see how it turns out. 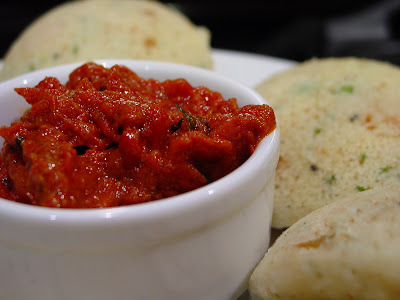 Manisha, you know what, i made more rave idlis last night! with two different chutneys and a tomato bhaji :)). i tried this just now and it is so droolably yummy.. Am go glad i tried it,, i cant believe something i made is so good. Thank you! We made this with our CSA tomatoes. Paprika and kashmiri chilli powder combo. All gone in one sitting. Thanks Manisha and Ammini. Piece of useless info trivia!